As Chief Rabbi of Prague. Rabbi and liturgical poet; born at Wallerstein, Bavaria, 1579; died at Cracow Sept. 7, 1654. Erroneously the editor of the "Megillat Ebah" concludes from his epitaph that Heller died April 23; Hock ("Gal 'Ed," p. 65) gives Aug. 2 as the date, while David Gans ("Ẓemaḥ Dawid," p. 59) places his death in 1649. Heller was brought up by his grandfather, Moses Heller, chief rabbi of the German communities. He was sent to Friedburg, where he studied under Jacob Günzburg. Thence he was invited to Prague by a rich merchant, Aaron Ashkenazi, who later became his father-in-law. There he studied under Judah Löw b. Bezaleel, head of the yeshibah of Prague. According to Azulai ("Shem ha-Gedolim," i. 74), Heller's second master was Solomon Ephraim Lenczyza, chief rabbi of Prague. At Prague Heller perfected his rabbinical studies; and in 1597, when scarcely eighteen years old, he was appointed dayyan in that city. In Oct., 1624, Heller was called to the rabbinate of Nikolsburg, Moravia, and in March, 1625, became rabbi of Vienna. There he reorganized the community and drew up its constitution. According to Hock (l.c. ), it was Heller who obtained for the Jews the privilege of having Leopoldstadt as their special quarter. In 1627 Heller was called to the chief rabbinate of Prague. On account of the Thirty Years' war the government imposed heavy taxes on the Jewish communities of Bohemia, including that of Prague,which had to pay a yearly tax of 40,000 thalers. As Heller was the chief rabbi he was compelled, against his will, to preside over the commission which had the task of apportioning that sum among the members of his communities. Although he acted with the greatest conscientiousness, some complained of unfair allotment. They accused Heller and the elders of the commission before the civil authorities of having spared the rich and laid the burden of the tax on the poorer people. Emperor Ferdinand II. addressed a severe censure to Heller, warning him not to repeat such proceedings. Heller's enemies, not satisfied, accused him before the emperor of having written against Christianity. The emperor commanded the governor of Prague to send Heller in chains to Vienna, but the supplications of the leading Jews of Prague combined with the esteem which the Christian officials had for Heller spared him that indignity. The Jews pledged themselves that he would present himself before his judges even if allowed to go alone. Heller accordingly set out for Vienna on Tuesday, Tammuz 5, 5389 (June 25, 1629), and arrived there on the following Sunday. On Tammuz 17, the Jewish fast-day, he was imprisoned together with common criminals. The Jews of Vienna, however, obtained his transfer to another prison. A clerical commission was appointed to inquire into Heller's guilt. It met on July 15, and among other questions Heller was asked how he dared to eulogize the Talmud after it had been burned by papal order. Heller justified himself very adroitly; but the verdict was that Heller properly deserved death. The emperor, however, commuted the punishment to a fine of 12,000 thalers, to be paid immediately, the incriminated writings to be destroyed. The fine was far beyond Heller's means; but the order was explicit that in default of payment Heller was to be stripped and flogged in the public squares of Vienna and Prague. The Jews again interfered in his behalf, and the fine was reduced to 10,000 florins, to be paid in instalments. By the help of generous Jews, Heller was enabled to pay the first instalment of 2,000 florins. Finally, after a confinement of forty days, he was liberated (Aug. 14), but deprived of his office and left without means. 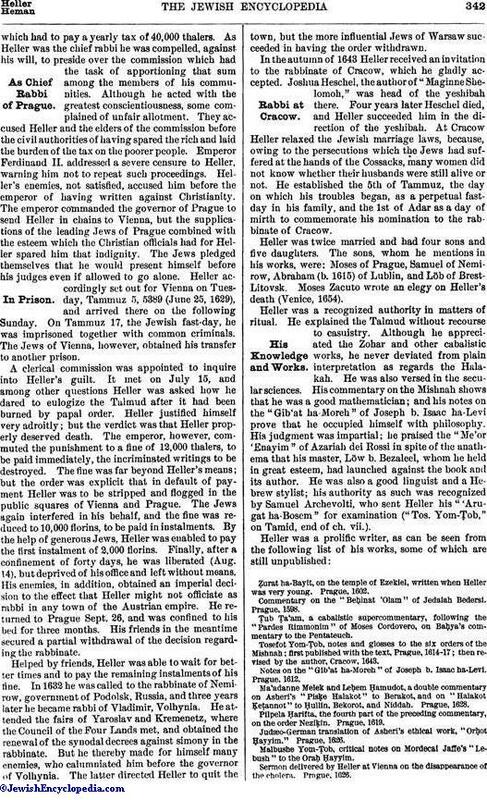 His enemies, in addition, obtained an imperial decision to the effect that Heller might not officiate as rabbi in any town of the Austrian empire. He returned to Prague Sept. 26, and was confined to his bed for three months. His friends in the meantime secured a partial withdrawal of the decision regarding the rabbinate. Helped by friends, Heller was able to wait for better times and to pay the remaining instalments of his fine. In 1632 he was called to the rabbinate of Nemirow, government of Podolsk, Russia, and three years later he became rabbi of Vladimir, Volhynia. He attended the fairs of Yaroslav and Kremenetz, where the Council of the Four Lands met, and obtained the renewal of the synodal decrees against simony in the rabbinate. But he thereby made for himself many enemies, who calumniated him before the governor of Volhynia. The latter directed Heller to quit the town, but the more influential Jews of Warsaw succeeded in having the order withdrawn. In the autumn of 1643 Heller received an invitation to the rabbinate of Cracow, which he gladly accepted. Joshua Heschel, the author of "Maginne Shelomoh," was head of the yeshibah there. Four years later Heschel died, and Heller succeeded him in the direction of the yeshibah. At Cracow Heller relaxed the Jewish marriage laws, because, owing to the persecutions which the Jews had suffered at the hands of the Cossacks, many women did not know whether their husbands were still alive or not. He established the 5th of Tammuz, the day on which his troubles began, as a perpetual fast-day in his family, and the 1st of Adar as a day of mirth to commemorate his nomination to the rabbinate of Cracow. Heller was twice married and had four sons and five daughters. The sons, whom he mentions in his works, were: Moses of Prague, Samuel of Nemirow, Abraham (b. 1615) of Lublin, and Löb of Brest-Litovsk. Moses Zacuto wrote an elegy on Heller's death (Venice, 1654). 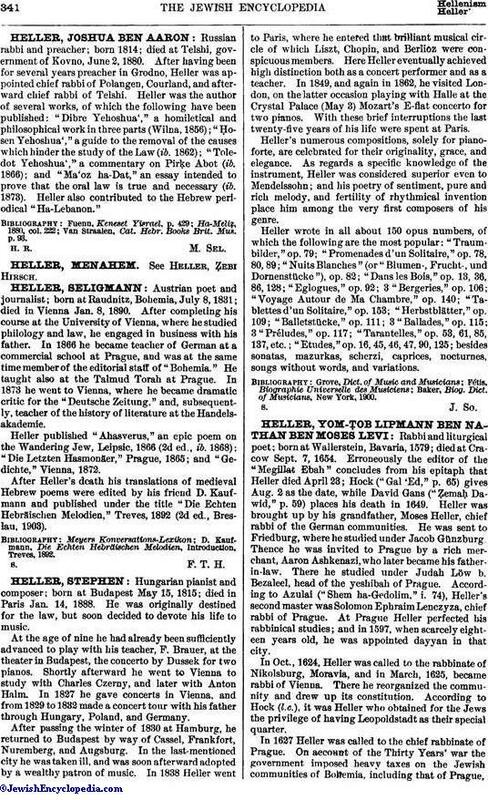 Heller was a recognized authority in matters of ritual. He explained the Talmud without recourse to casuistry. Although he appreciated the Zohar and other cabalistic works, he never deviated from plain interpretation as regards the Halakah. He was also versed in the secular sciences. His commentary on the Mishnah shows that he was a good mathematician; and his notes on the "Gib'at ha Moreh" of Joseph b. Isaac ha-Levi prove that he occupied himself with philosophy. His judgment was impartial; he praised the "Me'or 'Enayim" of Azariah dei Rossi in spite of the anathema that his master, Löw b. Bezaleel, whom he held in great esteem, had launched against the book and its author. He was also a good linguist and a Hebrew stylist; his authority as such was recognized by Samuel Archevolti, who sent Heller his "'Arugat ha-Bosem" for examination ("Tos. Yom-Ṭob," on Tamid, end of ch. vii.). Ẓurat ha-Bayit, on the temple of Ezekiel, written when Heller was very young. Prague, 1602. Commentary on the "Beḥinat 'Olam" of Jedaiah Bedersi. Prague, 1598. Ṭub Ṭa'am, a cabalistic supercommentary, following the "Pardes Rimmonim" of Moses Cordovero, on Baḥya's commentary to the Pentateuch. Tosefot Yom-Ṭob, notes and glosses to the six orders of the Mishnah; first published with the text, Prague, 1614-17; then revised by the author, Cracow, 1643. Notes on the "Gib'at ha-Moreh" of Joseph b. Isaac ha-Levi. Prague, 1612. Ma'adanne Melek and Leḥem Ḥamudot, a double commentary on Asheri's "Pisḳe Halakot" to Berakot, and on "Halakot Ḳeṭannot" to Ḥullin, Bekorot, and Niddah. Prague, 1628. Pilpela Ḥarifta, the fourth part of the preceding commentary, on the order Neziḳin. Prague, 1619. Judæo-German translation of Asheri's ethical work, "Orḥot Ḥayyim." Prague, 1626. Malbushe Yom-Ṭob, critical notes on Mordecai Jaffe's "Lebush" to the Oraḥ Ḥayyim. 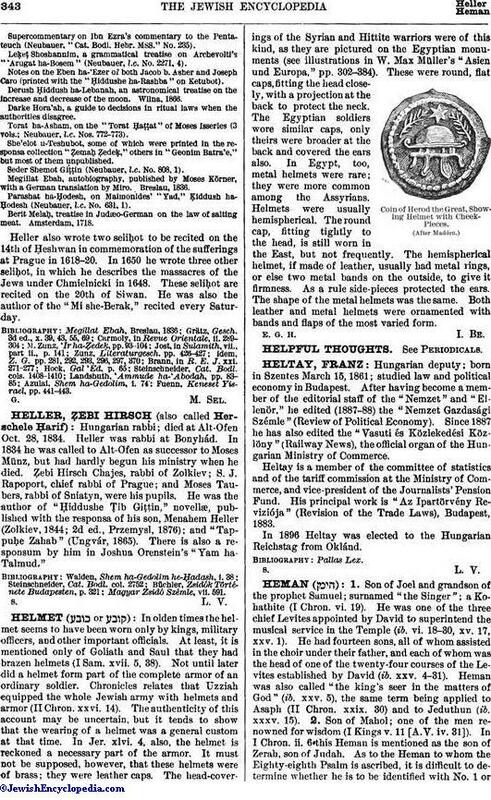 Sermon delivered by Heller at Vienna on the disappearance of the cholera. Prague, 1626. Supercommentary on Ibn Ezra's commentary to the Pentateuch (Neubauer, "Cat. Bodl. Hebr. MSS." No. 235). Leḳeṭ Shoshannim, a grammatical treatise on Archevolti's "'Arugat ha-Bosem" (Neubauer, l.c. No. 2271, 4). Notes on the Eben ha-'Ezer of both Jacob b. Asher and Joseph Caro (printed with the "Ḥiddushe ha-Rashba" on Ketubot). Derush Ḥiddush ha-Lebanah, an astronomical treatise on the increase and decrease of the moon. Wilna, 1866. Darke Hora'ah, a guide to decisions in ritual laws when the authorities disagree. Torat ha-Asham, on the "Torat Ḥaṭṭat" of Moses Isserles (3 vols. ; Neubauer, l.c. Nos. 772-773). She'elot u-Teshubot, some of which were printed in the responsa collection "Ẓemaḥ Ẓedeḳ," others in "Geonim Batra'e," but most of them unpublished. Seder Shemot Giṭṭin (Neubauer, l.c. No. 808, 1). Megillat Ebah, autobiography, published by Moses Körner, with a German translation by Miro. Breslau, 1836. Parashat ha-Ḥodesh, on Maimonides' "Yad," Ḳiddush ha-Ḥodesh (Neubauer, l.c. No. 631, 1). Berit Melaḥ, treatise in Judæo-German on the law of salting meat. Amsterdam, 1718. Heller also wrote two seliḥot to be recited on the 14th of Ḥeshwan in commemoration of the sufferings at Prague in 1618-20. In 1650 he wrote three other seliḥot, in which he describes the massacres of the Jews under Chmielnicki in 1648. These seliḥot are recited on the 20th of Siwan. He was also the author of the "Mi she-Berak," recited every Saturday. Fuenn, Keneset Yisrael, pp. 441-443.